problems and in this instance, almost all lectures were given by industry representatives. Students enjoyed the overall format and the use of real workplace examples. Group work generally rated more poorly in the unit evaluation than expected. Working with industry brought new challenges largely due to the mobility and time commitments of industry representatives in a field-based and global industry. A field-based study of soils and the factors that influence their development is a strong, broad introduction to geologic concepts and research. A course blueprint is detailed where students design and complete a semester-long field-based soil geomorphology project. Students are first taught basic soil concepts and to describe soil, sediment and rock properties using standard description procedures. Then, with minimal geological or field experience, they are led to design and execute a project that examines how soil properties differ as a function of processes, parent material and time. By designing and executing the semester-long project, students gain familiarity with the entire geologic research process including basic field observation, hypothesis development and testing, interpretation and presentation skills. During the course, students learn 1) the basic knowledge necessary to describe geologic materials (soil, rock, sediment) in the field, 2) to make observations and interpret them in the context of geologic hypotheses which they have developed, 3) to develop, and execute a field-based research project, 4) to integrate and draw conclusions about complicated semi-quantitative data sets, 5) to map and survey in the field and 6) to present their research in a public forum. By the end of the semester students are able to make and test hypotheses relating soil properties to the depositional environment, age and/or type of geologic deposits in which they form. The knowledge, skills and research experience gained in this simple, semester-long project serve students well in upper-level courses and beyond. An example project is presented from a 2nd order stream and its adjacent tributary alluvial fans in the Piedmont of North Carolina. Recent discoveries about the role of microorganisms in the establishment of the geological conditions in the planet have lead to the development of courses in Geomicrobiology. Unfortunately, most courses are designed for students with a strong Geology background, which is a limitation for universities that lack such courses. To overcome this limitation at our university, we have designed a special topics course entitled Introductory Geomicrobiology that was offered for the first time to undergraduate students from the Biology, Marine Biology and Microbiology Programs. To attract non-geology majors the course included topics such as description of Early Earth ecosystems, search for geo-biological signatures and current approaches in the search for extra-terrestrial life forms. An active learning environment was fostered throughout the course through different activities including oral reports of research papers in the subject, followed by Gallery Runs and class discussions. Our assessment strategies, both formative and summative, revealed that such presentations were an effective way to introduce students to eight main concepts of Geomicrobiology. Student performance was stronger in group discussions than individually, with Gallery Runs as the preferred class discussion technique. Overall, our assessment system proved that the design of the course was effective in teaching Geomicrobiology to non-geology majors. environments such as course management systems. Each student was assigned the role of a unique mineral and rock. They were required to create a separate web page for each, with a photograph and description, on MySpace.com, a popular social networking web site. They were also required to join groups based on the classification of the rock or mineral. Finally, they were required to link to the minerals that constitute each rock by becoming "friends." A post-exercise questionnaire showed all students found this a useful and enjoyable exercise, and most believed it helped them to learn and remember information about rocks and minerals. For an inquiry-based alternative to lectures and recall tests, I encouraged learners to become "geotourists"; that is, learners researched and developed a geologic guidebook to a United States National Park of their choice. Over the course of a semester, students wrote chapters on plate tectonics, the rock cycle, geologic history, groundwater and hydrology, geomorphology, and topographic maps. By applying the physical geology concepts to a particular location, learners found the material to be relevant and engaging. Keys to success included developing detailed rubrics, reading multiple drafts, and using appropriate instructional technologies. Students who participated in the class reported that the project involved considerable work, but was more interesting and relevant than lecture exams. two parallel coding approaches for analyzing student navigational choices. Taken together, our coding enables correlation of navigational characteristics with performance and lends insight into problem solving by building on a conceptual framework modified from the cognitive science field of Naturalistic Decision Making. 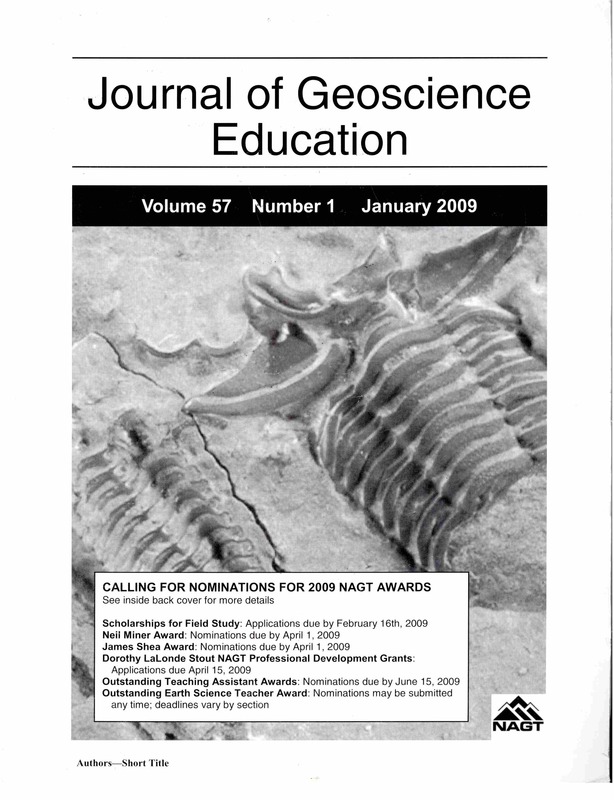 Our results indicate that most advanced geology undergraduates are capable of recognizing important features in the field, however lower-performing students fail to systematically test multiple interpretations of their data as reflected in poorly planned traverses across the examination field area. Specific track sequences, especially those involving reoccupation of locations, show particular difficulties in aspects of problem solving that are reflected in low quality interpretations on finished maps. 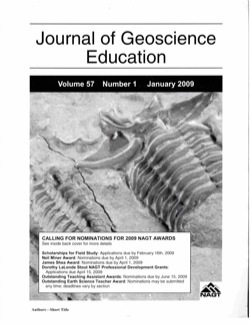 Our study offers new tools and an independent approach to gauging student skills in geologic field problem solving. The complexity and interrelatedness of aspects of the geosciences is an important concept to convey in an undergraduate geoscience curriculum. A synthesis capstone project has served to integrate pattern-based learning of an introductory Earth History course into an active and process-based exercise in hypothesis production. In this exercise, students are given (1) an imaginary global continental configuration and (2) a general categorization of the global climate. Students then work through cause/effect relationships in Earth processes and hypothesize global biotic and abiotic patterns to be mapped upon the imaginary continental framework. Presentation and discussion of each student's imaginary earth and his/her interpretation of the various mappable parameters engages students in each other's reasoning and creative thought processes while promoting group learning and increasing science communication skills. Examination of the evidence and procedures used in the retrodiction of actual global paleogeographic scenarios is then placed in the context of this project. In practice, students have responded enthusiastically to the opportunity to develop geographic interpretations of an imaginary paleogeographic framework using their understanding of modern Earth systems. Upon exit evaluation, greater than 85% of the students taking part in the exercise felt more confident in their ability to hypothesize patterns from process. Neil Miner Award, James H. Shea Award, Outstanding Earth Science Teacher Awards by region.